As Serena Williams‘ bid for her historic Grand Slam continues at 7 p.m. tonight at the U.S. Open, the super structure of Arthur Ashe Stadium’s new retractable dome will hang overhead. 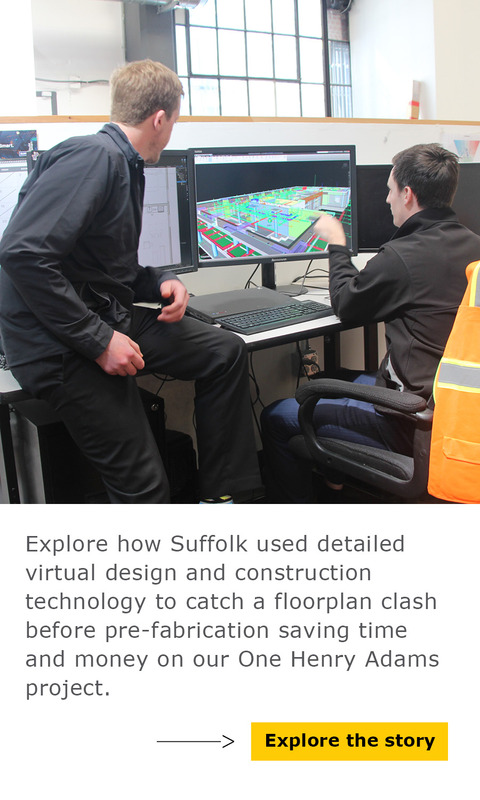 The lightweight-fabric roof won’t be complete until next year, but we wanted to take a moment to share the backstory of the innovative thinking behind this unique construction project. The largest tennis stadium in the world is sinking into a mound of coal ash decomposing at a rate of about a half an inch per year. So putting a retractable roof on the 23,771-seat structure that can’t support more weight was a particularly gnawing conundrum that kept countless architects up at night. In fact, the Detroit-based international architecture firm, ROSSETTI, felt compelled to continue working on the riddle of covering Arthur Ashe Stadium even after initially losing the bid for the $150 million dome in 2009. ROSSETTI couldn’t resist the challeng e of solving what other firms and four architectural studies couldn’t — even at the risk of taking a loss on a design that wouldn’t see the light of day. “This is probably the first and only time we have done something like this,” Jon Disbrow, ROSSETTI’s lead architect for the project told us. As the U.S. Open commences this week, the brightest lights in the sport will literally shine on the super structure of their design. The winning design was ultimately deemed unfeasible, so the United States Tennis Association (USTA) doubled back to ROSSETTI. All along ROSSETTI had maintained its relationship with the USTA because they were also working on the master plan for the stadium’s surrounding grounds, known as the Billy Jean King National Tennis Center. The USTA’s Managing Director of Communications, Chris Widmaier, said the fact that ROSSETTI worked on the design for a year-and-a-half after initially losing the bid is proof that the ultimate solution could be nothing short of innovative. “ROSSETTI proved their creativity once again by coming up with this design,” Widmaier told us. “Previous thinking had been ‘How do you put a roof on Ashe?’ whereas their thinking was ‘How do you put a roof over Ashe?’ You build this super structure around the existing building with new technologies, new materials. Arguably the highest attended annual sporting event in the world, alongside events such as the Tour de France, the U.S. Open is contested during New York City’s dry season in late August through early September. Nevertheless, significant rain delays have rankled tournament organizers, fans, players and television broadcasters. From 2008 to 2012, the men’s championship match was pushed from Sunday to Monday due to rain. 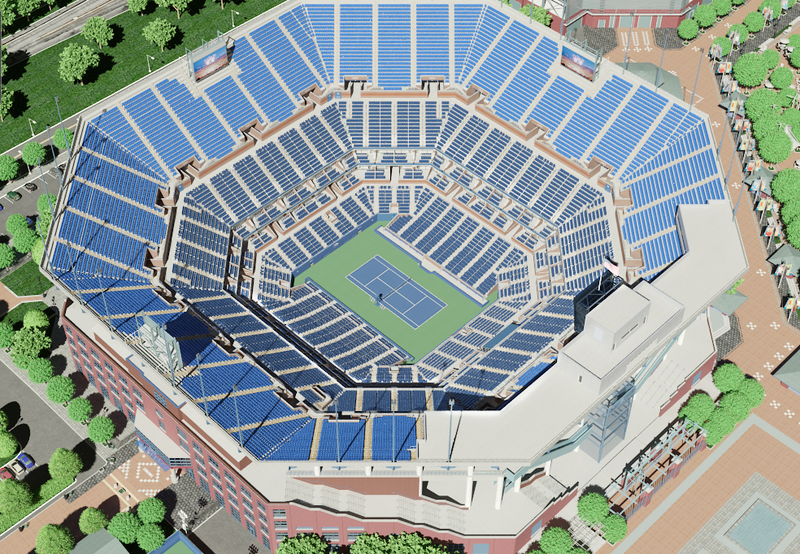 A rendering of what Arthur Ashe Stadium looked like before construction of the roof began in 2013. Courtesy of USTA. Wimbledon and the Australian Open already have retractable roofs that can be closed in mere minutes and the French Open is working on a roof of its own. Widmaier said almost 50 percent of U.S. Open fans come from outside New York and it’s difficult to offer rain checks to them all because most tickets sell out before the tournament commences. “We’re a huge boon to the City of New York,” he said. “We do $750 million in direct economic impact. You’ve got people who are scheduling their vacations around the event or coming from foreign countries specifically for the U.S. Open and when weather interferes it’s just unfortunate. Ironically, ROSSETTI’s original plan for a roof wasn’t feasible. The plan called for reducing the weight of the stadium by removing precast concrete from the stadium’s upper bowl and replacing it with a lightweight composite material. That would decrease the overall weight of the stadium enough to support the weight of the roof. But under that scenario the roof would’ve taken 20 minutes to close and the USTA wanted to be able to close it in five to seven minutes. The umbrella roof currently under construction doesn’t put extra pressure on the octagon-shaped stadium. And because it’s a freestanding structure, floating 15 inches above the lip of the upper bowl, it doesn’t subject the stadium to the city’s latest and more stringent building codes. Perhaps the biggest innovation of the construction project that began in 2013 is how the support beams and pile caps maintain a minimal footprint despite being anchored into such poor soil and despite having to support a 5,000-ton super structure. There are only eight support columns at the corners of the octagon. 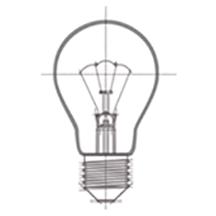 They are designed as tripods with one vertical center column and two angled bracing beams. This design eliminated the need for an underground grade beam to link the columns horizontally along the perimeter of the stadium. Such a beam would disrupt underground utilities and electrical infrastructure along the way. With help from WSB Structural Engineers, the eight columns were designed to branch out to support four steel trusses that will ultimately create a 250-foot-by-250-foot opening over center court. The retractable canopy will be made of a translucent Teflon-coated woven fiberglass material that is extremely durable and weather resistant. In order to develop enough bearing capacity to support such a structure, the piles drive 175 feet into the ground and feature anywhere from 26 to 32 piles. 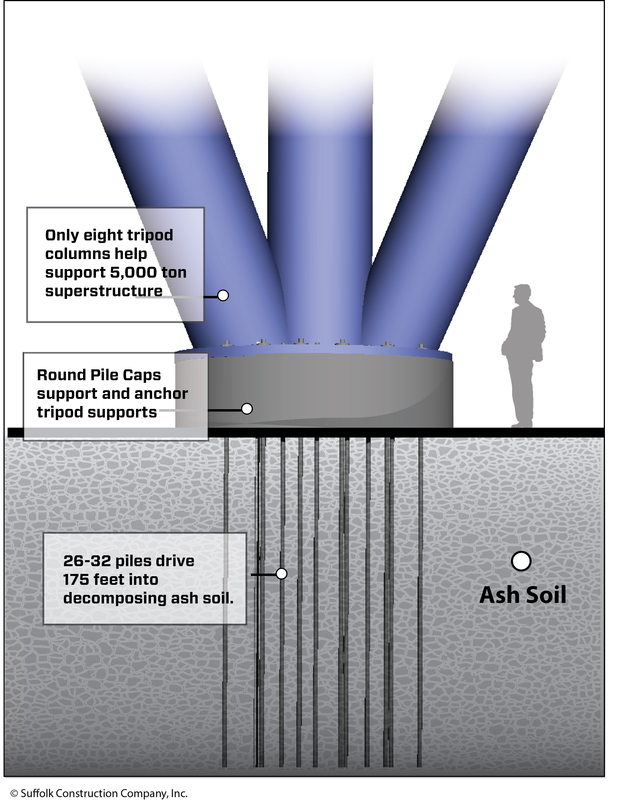 A pile cap usually has between four and 10 piles. Disbrow also said under normal soil conditions, the weight of such a heavy load would typically be spread out amongst all the columns. In addition to all of the design that went into the roof and the columns, ROSSETTI’s team put a lot of thought into how covering an outdoor stadium would make the court play differently. Typically the ball moves faster on indoor courts because there’s no wind resistance. So closing the roof in the middle of a high-stake match can be a game changer. Disbrow said they used state-of-the art computer programs and wind tunnel testing to model the interior conditions of the court when the roof is closed. ME Engineers, which did the mechanical design for the HVAC system, also used computational fluid dynamics tests to ensure condensation won’t make the court slippery when the roof closes. While late summer is still primetime for most construction projects, the crew building the Ashe roof had to cleanup and break for a two-week tennis tournament. That’s an inconvenience for any construction schedule, but that lost time is the fans’ gain. Even though the retractable portion of the roof won’t be installed this year, the portion of the structure that is in place will provide some much needed shade for fans. And the exposed super structure will also be an unusual sight at this year’s Open since fans typically aren’t invited into a stadium that’s still under construction.